In case you’ve been under a pile of livestock all day, you know by now that former Daily Show host and friend to all the beasts of the air, land, and sea Jon Stewart graciously helped two goats found meandering around the tracks of the N train in Brooklyn. Or, if you think about it, maybe … they helped him? No, wait, we thought longer. He definitely helped them, by transporting the pair to an animal sanctuary for medical care. Looks like you know what you need to do to meet Jon Stewart and get a free checkup. According to the New York City MTA, the goats, subsequently named Willy and Billy, were found walking between the Fort Hamilton Parkway stop and the 8th Avenue stop, presumably because it takes pretty much the same amount of time. “We’re told they were munching grass,” MTA spokesperson Jon Weinstein told the Times in what is probably the best update any MTA spokesperson has ever had the pleasure to deliver. Spectrum NY1 chronicled the duo’s capture on their Twitter Monday afternoon. After the goats were tranquilized, Stewart and his wife Tracey drove them part of the way to the Farm Sanctuary in Watkins Glen, New York. Stewart and his spouse have worked closely with the animal shelter since 2015, even opening its fourth location on their farm in New Jersey. 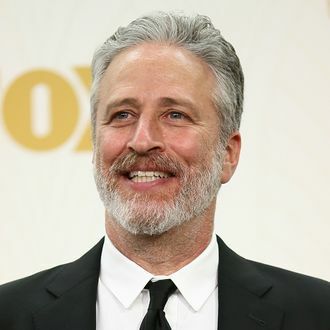 It’s suspected the goats likely escaped from a slaughterhouse, which means meeting Jon Stewart was actually only the second most exciting part of their day.